Niet zijn allerbeste werk, maar toch een fijne comeback. Zomers! Wow, was für ein Comeback von Timberlake. Man muss einfach mittanzen, toll! Hoffentlich wird das der Sommer-Hit! Ich habe mich gleich in den Song verliebt. So catchy und toll gesungen. hätte es verdient ein großer Hit zu werden. Auch ich habe mir bereits ein wenig in diese Nummer verliebt. Besonders im den Refrain, wenn Justin in die höhen geht! Hoffe auch auf einen Hit!! Ich denke schon, dass sich der Song gut kommerzialisieren lässt. Recht simple, aber sehr markante Struktur mit Gute-Laune-Garantie, ein wenig schwingt auch der alte Jacko-Vibe mit. Clever gemacht, dürfte wirtschaftlich reinhauen - für mich allerdings letztlich nur solides Mainstream-Handwerk, für das ich jetzt nicht brenne, mir aber durchaus auch ganz gerne mal so nebenbei anhöre. Edit: Da muss ich mittlerweile doch auf eine knappe Fünf aufrunden. Macht unheimlich gute Laune und geht total positiv nach vorne. Bleibt natürlich Mainstream pur, but so what? Yeah I gotta raise to 6 stars, it's just awesome and spread cheerfulness. einzig gut ist im song das " cant stop the feeling" - das reisst den song raus und gibt letztlich ne vier,aber insgesamt geht die nummer in ordnung. Starker Dancetrack, den ich gerade in der Pause des ESC gehört habe. 13.08.16: Und heute habe ich ca. 100 Betreuer und Kinder im Waldheim meiner Tochter dazu tanzen sehen, Wahnsinn. 5 => 6. Groovt klasse und ist als Dance-Track wirklich prima. Als reiner Song funktioniert er bei mir nicht. Löst lediglich ein leichtes Hibbeln aus. Aber auf der Bühne war es eine unglaubliche Nummer, die phantastisch abging. Ich mittele auf knappe 5 Sterne. Was finden die Leute nur an diesem belanglosen Liedchen ? Der Typ sollte was anderes machen. Schuhe verkaufen, oder in eine Boutique reinstehen und Jeans mit Löchern verkaufen, wie es zur Zeit 'in' ist. Musikalisch ist er einfach eine Null. Der kann überhaupt nichts. Und hier macht er einen auf Michael Jackson. Ganz übel. Manche können's einem nie recht machen. Auch ich kann den überhaupt nicht leiden, insbesonders seine Musik. Aber das ist doch echt ein gute Laune Hit! Im kennt man auch nächstes Jahr noch..
Mir ist es ein Rätsel, warum so ein Song jetzt wieder abgefeiert wird. Ein wenig benötigt der Song bis er im Ohr ist, dann dafür aber richtig. Wirkt nach einer effektiven Formel produziert und verfehlt den Effekt nicht. Glaube aber nicht so daran, dass der Song ein langes Haltbarkeitsdatum hat. Jetzt macht er Spaß, wenn er nicht zu oft zu hören ist, doch ist nicht so was besonderes. Einige Timberlake-Stücke sind da stärker u. die höre ich heute noch super gerne. 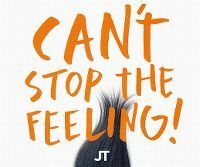 A whole heap of positive fun in this track and I like that Justin Timberlake still has it. Fantastic effort. Geez this got tiring fast! Unfortunately i fail to see the appeal in this despite it's catchiness, Justin is able to do better than this generic sound. gute laune dance funk, der wenigstens nicht negativ anstössig wirkt. etwas aufgesetzt. sonst ok. .. und noch etwas für member rhayader. der sollte mit seinen oft generell urteilenden negativen rewiews im modernen und old shool dance music bereich endlich besser, .sorry., die klappe halten. der versteht nämlich nichts von dieser musik . Das ist vielleicht der beste Gute-Laune-Song der letzten 10 Jahre. Selten, dass man heute noch sowas hört. It was good initially but it got tiring very quickly by the time Trolls was actually released six months later! I don't see the point in why this was released six months prior to the movie's release, if it was released closer to the movie I would of given it a solid 5*. Let's hope this doesn't set a precedent! The first thing I observed when I originally listened to this song was how personality-free it was. Usually when I listen to a Justin Timberlake song, he brings something to it which makes it quintessentially him, but there really is no show of that here, it really could be performed by anyone and it wouldn't sound all that different. And that really is my main criticism of the song, which is a little funny, since I really can't stand most of the solo songs he has released due to his personality. Look, there might be the occasional song of his I like where the aforementioned rule does not apply, and I generally see Justin Timberlake as a pretty cool and suave fella, but this is the case more often than not, so essentially, I'll never be a fan of his, and it seems that, personality or no personality, he's probably going to lose either way. In saying that, there are occasions where I have able to get in to this song, but it is a little too pedestrian for the most part for me to get much out of it. Und jetzt auch noch Grammy Gewinner 2017! Naturally the song with the CAPS LOCK title that was the soundtrack for a movie called 'Trolls' ended up being released over six months before the movie was in the cinemas, therefore being flogged to death on radio like no other song in 2016 as well as spending a very long time in the ARIA top 50. I quite liked it originally, as it does have a nice groove to it and Justin's voice has always suited this type of funky music. But almost 12 months after its initial release and I'm utterly tired of this song. Even now it's too unavoidable for my liking. It's hardly revolutionary for a '10s disco-pop track, so a lot of its shine has worn off for me. I just hope no one else copies the devilish release strategy of this song. Adult Contemporary radio is simply the worst. It seems to exist to cause the least offense possible, and in doing so, reveals unpleasant intentions. Like, you know how you listen to the radio sometimes and you'll hear edited versions of hits with raps taken out? There's a severely uncomfortable level of gentrification at play that makes me ill. It's kind of bizarre that it doesn't get called out more often, because its existence either means that those in charge are intentionally trying to whitewash the radio, or they're seeking approval of those who do desire this. You know the whole adage of people losing sponsorships when they say problematic things? That's because most normal people don't want to associate with this sort of thing. Rather than bog this review down with that, I'll present a more amusing take on these things. The format is called Adult Contemporary, some 9 months or so ago, the biggest songs on the format included 2 teen pop singers (one even still a teenager), and this, a former teen pop idol performing a song written for a children's movie. This is radio for the mature adult clearly. Anyway, as I write this review, this song, a year since release is STILL the 5th most played song on adult contemporary radio. Imagine the hell of having to hear this song every day for years to come. A song that personally got old in weeks. Really it's so disappointing to come from Justin Timberlake, who's always been ahead of the curve, never dulling down to capture every common denominator, and making some incredible music in the process. This is just unrewarding pap. I sincerely compare this to Pharrell's 'Happy' for obvious reasons and the stigma surrounding both tracks. Unfortunately Justin doesn't pull it off as good as Pharrell and comes across as cheesy and desperate for recognition. Musik, die man nach einmaligem Hören sofort wieder vergisst oder nach zehnmaligem Hören nicht mehr ertragen kann.